On January 17, 2019, our wonderful student Serena A. took part in district round of German Olympics in CVČ Dúha, Hlohovec. She was second and was promoted to higher round. We believe she will be successful in regional round as well. Thumbs crossed! Zuerst hatten wir den schriftlichen Teil. Das war ganz okay. Manche Fragen waren ganz schwierig aber es war nicht so schlimm. Hörverstehen war besonders interessant. Also zuerst Hörverstehen, später Leseverstehen, das war leicht und dann Grammatik, die auch ganz einfach war. Na danach hatten wir eine 30 Minuten Pause, damit sie unsere Ergebnisse zusammenrechnen konnten. Sie sagten uns, wer zum nächsten Level weitergehen kann. Nur 3 ich denke ,haben es nicht geschafft und mussten, leider, nach Hause gehen. Also schließlich kommt der mündliche Teil. Och... wir haben soooo lang gewartet.. Na endlich kam meine Zeit als die Vorletzte und ich wusste nicht, dass alle vor mir in dem Zimmer blieben und was ich sagen werde , hören werden. Na ja, aber das war nicht sooo schrecklich. Also es gibt ein Bild zu beschreiben und 3 Themen, die wir besprechen mussten. Die Themen waren cool, ich war glücklich. Dann mussten wir eine Stunde warten bis sie unsere Ergebnisse uns sagten. Wohooo also um 14:00 hat es alles beendet. Das war echt super und einen tollen Tag! Also mal sehen nächstes Mal. Teachers, parents, and pupils can rightly be proud of our High School students are excelled in Slovak language and literature school leaving examination. Based on percentage success, our pupils ended up on the 3rd place in the Trnava region and ranked among the 7% most successful schools in Slovak language and literature exams. We firmly belive that they will be as good in remaining subjects, and that they will successfully step out into their new future. "I am very proud of what we have achieved over 4 years of High School. I am more than pleased with the results of school leaving examinations- these results have confirmed that individual approach to pupils and value-oriented learning are the way of achieving personal goals. 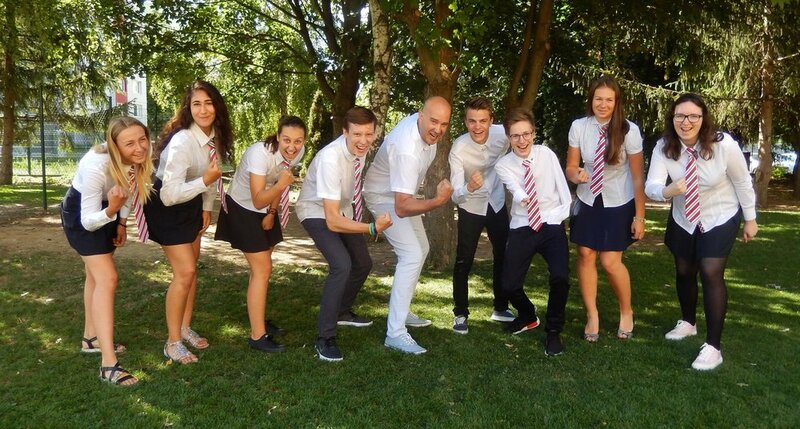 Studying in a classroom with an international program was a great challenge - within one school year pupils have had written international exams of three subjects, and at the same time they had their school leaving examinations from Slovak language. When I see the results, I'm happy. It is a proof that the pupils who leave our school will be able to meet the challenges with their heads raised high up." - Mgr. Ľubica Srnáková, director of BESST Private Bilingual High School. From April 25th – 28th 2018 the FIRST LEGO LEAGUE world championship took place in Detroit, USA. IT-PRO BESST Team from our school, consisting of 9 members, also attended the event. In a very strong competition of 104 teams from whole world they managed to get through to the finals and win a fantastic 3rd place. The team went through Regional League in Bratislava, the Semi-finals in Lodz, Poland and Central-European finals in Aachen, Germany. During the championship, the IT-PRO-BESST Team gained second best result amongst all teams, and after the semi-finals round with the winning team they finished on a fantastic third place. Congratulations IT-PRO-BESST Team, we are proud of you! Honourable mention certificate for Serena A. Last weekend group of our students attended Žilina Model United Nations - ZAMUN. Talented speakers gathered for an academic simulation of different United Nations. Our student Serena Faith A. was ranked as one of the best and got Honourable Mention Certificate. Congratulations! 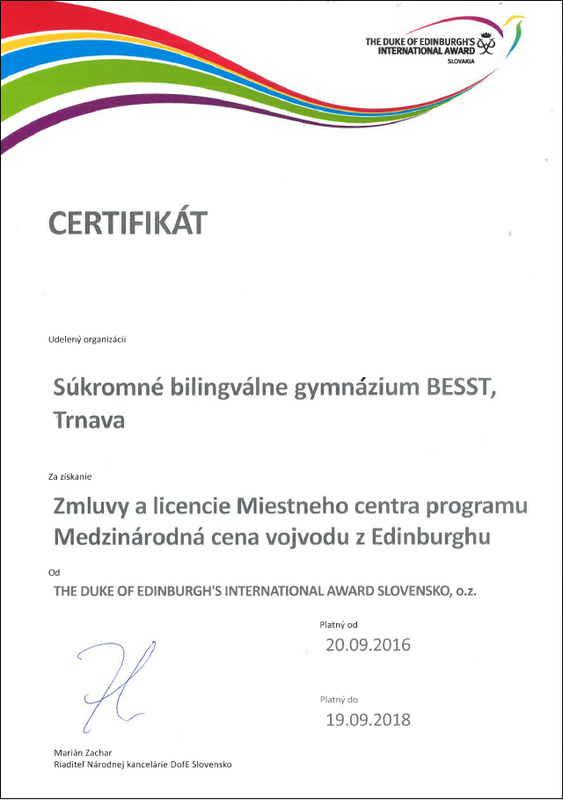 We would like to congratulate our student Viki Dz. who plays basketball in the Ivánka pri Dunaji, to 3rd place in Slovak basketball competition F4 which took place in Košice on May 26-28, 2017. 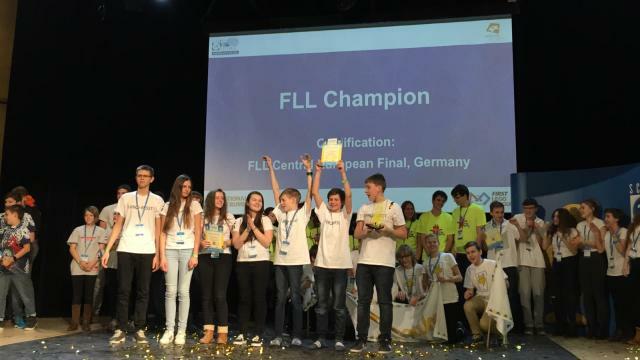 Our IT-PRO-BESST team achieved 10th place in the European finals in Regensburg. Our IT-PRO-BESST team took part in the semi-final FIRST Lego League competition that was held in February 4-5, 2017, in Debreczin, Hungary. 27 teams from four V4 countries (Slovakia, Czech Republic, Hungary and Poland) took part and our team won the 1st place in the Robot Game, 2nd in the Team Work , and 3rd in the Robot Design category and thus became the champion of Slovakia, and won the semi-finals with the best score. Our IT-PRO-BESST team is getting ready for the European Final competition that will be help in Regensburg, Germany, in the beginning of March. Good luck!